Let’s face it – not everyone is in love with the traditional enterprise architecture diagrams that are based on the ArchiMate* standard. Here, more or less, is a typical ArchiMate view. What if there was a way to create literally any type of visualization you wanted – from a common, central, “single version of the truth” repository? Something your grandmother (and CIO) will love? The first step is to unlock your enterprise architecture data. In the recent article Crossing the EA Chasm: Open Repository Strategies for Enterprise Architecture, I described an open data access strategy for providing easy access to EA data from virtually any open source or COTS (commercial-off-the-shelf) modeling, data visualization, machine learning, or business intelligence platform. 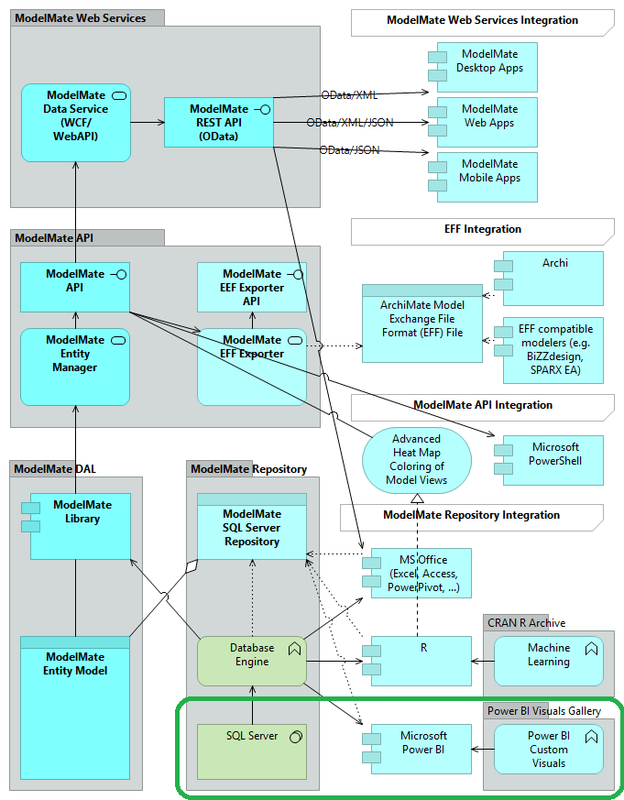 The latest version of the ModelMate architecture is depicted below (October 12, 2016). What sorts of visualizations does an open repository strategy like ModelMate enable? 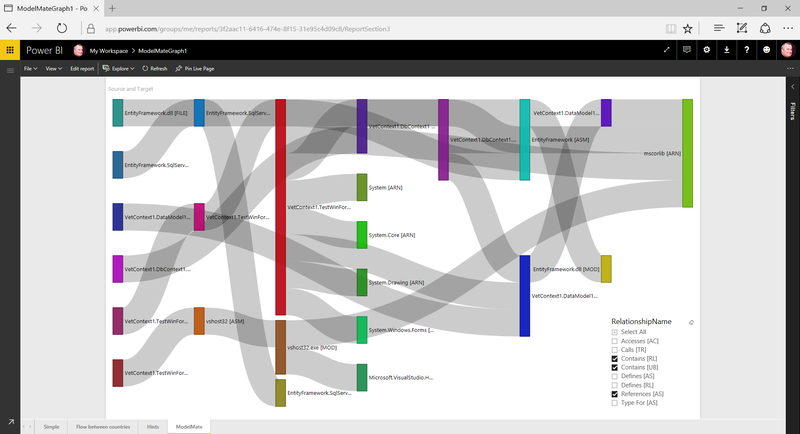 Check out the following ModelMate Graph rendered as an interactive EA exploration tool using Microsoft Power BI, the free desktop edition. This is just one rendering – the number of possibilities is limitless. From Power BI Desktop, it takes a couple clicks to publish a live, interactive, web version of the model to the cloud – the same ModelMate model that was used to create Figure 1. 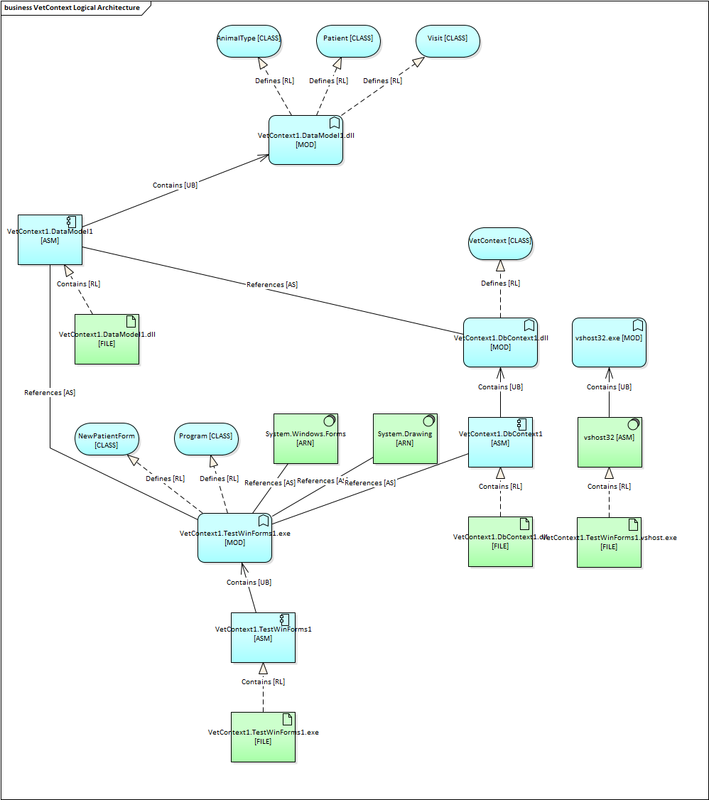 Click here to check it out for yourself: ModelMate Graphs running in the cloud. The above “spaghetti” visual is just one of the dozens of custom visuals available for Power PI. Here’s a sampling…. TIP: To use Data Science platforms like Power BI and R to get the most out of your EA data, consider looking into the Microsoft Professional Degree Program in Data Science. Please email me if you have any questions or additional comments at mwherman@parallelspace.net. p.s. Don’t forget to email a copy of the link to your grandmother (or your CIO). Please add your feedback in the Comments section below. p.p.s. Here’s an updated view of the same VetContext ModelMate model using the latest version of SPARX Enterprise Architect version 13 that was released earlier this week. The layout was created using the Digraph automated layout feature. When you have a powerful and easy way to scan and ingest arbitrary sized datasets, features like automated layout and routing become critically important.